So What Are Drawing Basics? and the level of your art will catapult. The "drawing basics" are the five main skills of drawing. They're the ability to: recognize edges, lines, and angles; to reckon proportion and perspective; deciphering shadow, highlights, and gradations of tone; and lastly, the ability to unconsciously drawstring them all together - which comes to you with practice. In fact, "drawing skills" don't even require special manual dexterity - that has little or nothing to do with drawing. Sure, certain techniques require a steady hand - but, like any other skill, they're learnable and they'll improve with practice. All of them. The truth is - and you might resist this statement - if you can write your name, not only do you have the manual dexterity to learn to draw, you are drawing. You just don't think of it that way. And I know, you're thinking way past handwriting when we're talking about drawing. I am too. You don't need any special genetic gift to draw. But you do need to be taught the basics. What drawing does require is the ability to switch from left-brain or from what Dr. Edward's calls "L-Mode" functions like language, counting, logic, and the ability to abstract, to right-brain "R-mode" or Artist's Mode skills. These are the nonverbal, intuitive, spatially oriented, gestalt-like, "in-the-moment" skills. 5) the unconscious skill of "pulling it all together". That's it. That basically sums up the basic skills you need to hone up on - or more likely, need to discover and be shown in order to draw. The good news? All of these skills are learnable. All five of these skills are skills of observation - that is, they're skills clustered around truly seeing. The ability to draw a likeness of something you see out there in the world (like a dog, a cat, a friends portrait, a landscape scene, a caricature) rests entirely on your ability to draw what you see. To "draw what you see" you have to see first. You have to learn how to observe the way an artist does. I know, you're saying " thanks but I already see fine, there's nothing wrong with my vision." I entirely agree with you. Let me ask you this. For instance, when you look at a chair, how much are you really "seeing"? That is, how close of attention are you paying? Consider this: three thousand particles of information (or something like that), are bombarding your brain every second screaming for attention. Your brain is responding to physical sensations, the itch in your wool sweater, your hot, cramped toes, your falling blood sugar level, fragments of a dream you had last night, the radio, TV, the flicker of your computer screen - and that's just for starters. Point is we're all inundated with information every instant of the day. "I guess the question is how close of attention can you afford to give any one task right now?" With so many other things grabbing at our attention, it's amazing we can focus our attention at all. Slowing down enough to really observe something is important for any kind of true appreciation. Think of yourself as a reporter. What's a reporter do? They relate and record facts, figures, pictures, and observations about an event out there in the world. True reporting means focused listening, looking, or observing. It can involve any sense - (though we're concerned with sight right now). It means paying such close attention you can report what you saw, or heard, or felt, to another person or even set it down on paper - like you do when you're really drawing. And when someone reads your report or looks at your picture, they feel like they're there. Sure, you're subtly aware of all that, but I'll bet unless someone has told you, or I tell you what to look for, when it comes time to draw the chair, you won't know where to start. And then you'll probably draw "four straight legs, a flat part to rest your backside on, and a backrest" . That is, you'll whip something down on paper you thought was the chair and forget about all those other details. And the thought of the chair you've drawn, well it's literally that: a thought. It was a convenient abstraction, a preconceived memory of what "chair" means to you, and that's probably the same thing it meant to you when you were three years old rather than the chair you see in front of you. So how can you do better than this? Picture a sunset on the Pacific Ocean. You're looking west. 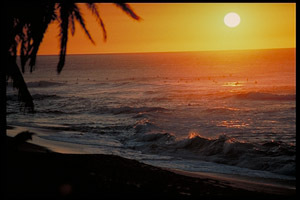 The sky is clear and is turning fiery orange on the horizon, the water is shimmering, a few stars are coming out. Now imagine you're looking straight up out into space. Point with a finger so you can look right up you're arm, like you're taking aim at a star. Now follow you finger as you slowly lower your outstretched arm like a crane from the dark of deep space, through purple, all the way down to the oranges and golds of the sunset until whammo, you hit the horizon. Focus on the "line", that is, the edge made by sky meeting ocean (also known as the horizon). They don't really touch, but you can say "at this point, the sky stops and the ocean begins". Now that's an edge. And as you look your way around that gorgeous sunset picture, notice the edges formed between all sorts of other parts of the picture, like between the palm tree leaves and the sky or water, or between the beach and water, or even between the sun and sky. Edges all. So skill Number One is the ability to decipher edges. That wasn't too tough now was it? The Second Skill: recognizing non-object shapes or "spaces"
Pick an object in the room. Why not a chair again? So pick a chair, any chair. You could use our director's chair here if you like. Close one eye if you're working on a real chair at home, it doesn't matter which eye - you'll automatically figure out which works better for you. 2) Seeing the "Hole in the donut", or recognizing spaces. This is the second skill you'll learn if you want to learn to draw. Learning to see what's not there is just as important as seeing what is there. Let's go back to the chair example. that pinches down on the "flat part you set your backside on"? They form something of a rectangle, right? Look at the illustration to the left here. The four edges of this space we're talking about are numbered and just below that, this space is colored. Now look around the chair some more. See all the parts of the chair? They're all a red-brown, right? And all the parts that "aren't the chair", are just the background white, right? Now notice that all the other white parts around the chair are either triangles or rectangles or some combination of those. Here's the big step: Imagine you're going to draw those white spaces - and just those white spaces. You're no longer looking at the chair per se. (This is easier if you look with one eye or if you squint.) And now if you pulled out a paper and pencil and drew those geometric white shapes, guess what? When you finish, you'd have drawn the chair - but in reverse. That is, by drawing the white spaces without even trying you'd have accidentally drawn the chair. Pretty cool, don't you think? Just for fun, check out this next picture: the chair has been whited out and all the white spaces have been colored black. Now concentrate on only the black shapes. Forget about the chair. Look at the different black shapes until you see them as distinct and unique "stand-alone" shapes. You may have to stare for a little, but it'll come to you. attention on what was not there, appreciating those non-chair spaces like they were as real of the chair itself, you actually tricked your brain. You went against the normal tendency to look at only what was there and ended up drawing a chair. And not just drawing any old chair - but the one you were actually looking at. And drawing it accurately. This is called recognizing negative space. Learning to push aside what your dominant, language-driven, quick reference "left" brain wants to see, rather than seeing what's really there in front of you (the right brain's territory), is a hurdle you can learn to easily master with some simple exercises. 3) Recognizing Proportions, Perspective, Scale and Angles. Have you ever heard farmers or horse traders talk about a horse's height? If so, maybe you've heard them say something like "yea, he's a big one. Stands 14 hands high at the shoulder". It's a way they've developed to talk about dimension. And by 14 hands tall they literally mean 14 "hands" - 14 human hands high, lined up palm to fingertips to palm - 14 times. So a hand is their unit of measure, just like the old English kings "foot" was literally the length of the kings foot. We still use that today. And of course there's the artists thumb. What all of these have in common is that they're some kind of convenient ruler that's fairly constant and tough to lose. (Well harder to lose than a ruler anyway.) And some kind of rule is our stepping stone into proportion. And that's what this third skill is about: using something convenient, constant and relatable (therefore proportionate) to the task at hand. When you see an artist with his arm fully extended, sighting down it like a hunter would aim down a rifle barrel, he's not admiring his thumb. He's asking this question: "how big is this part of the picture compared to my thumb or this pencil?" Once he's got a feel for "how many thumbs away the armrest is from the back rest, and how many pencil sections long the chair legs are", he can accurately reconstruct what he's sees in the real world in front of him on to his drawing board and paper in those terms. Does that kind of make sense? Let's walk through an example. Remember the chair example above? All those triangles and squares that make up the white space exist in a relationship to one another. Our job next is to figure out what that relationship is. Here's a ruler - we'll use it for "sighting"
To recap, we're going to put in terms of those units all the important parts of the chair. In that way we'll be "relating" the chair to the ruler. And you would continue like that to go around measuring the other parts of the chair or whatever it is you're drawing in the same methodical way. This sizing-up technique is called "Sighting". And it's just an artist's word for visually reckoning and measuring the objects of your drawings. It's a key skill you need to learn to get a feel for proportion. There are two things you need to remember when sighting. First, you can use any kind of measuring aid (like the ruler in this case) to size up your subject. But secondly, to keep your measurements consistent, your measuring tool must be consistent. If you used a ruler like we did above, lot's of artist's will hold it (or their pencil, or their thumb), at an arm's length. Why an arms length? Because an arm's length is pretty easy to duplicate - your arm doesn't change a whole lot in it's length during the time it takes you to draw a picture or during your adult life. So it's pretty consistent. But it's not important that your measuring device (the pencil or a ruler or your thumb), are always an arm length away - so long as your measuring device is always the same distance from your eye during the course of drawing that picture. But it's just easier to maintain that whole apparatus (your arm, and eye, and pencil, ruler, etc.) and the distances between them consistently with your elbow straight and your arm fully extended. Why keep all those distances the same? Because the perceived proportion of the ruler changes with the changing distances. If our "three unit ruler" is actually three inches long, it won't appear to be a consistent three inches if we keep changing how far away it is from our eye as we compare it to objects out there in space*. Try this: hold your right thumb about 5 inches in front of your right eye. (Close your left eye.). Your thumb looks pretty big, right? Now, straighten your right arm out so now your thumb is an arm's length from your eye. Which is bigger? Simple, right? When your thumb is right in your face, it looks a whole lot bigger. Now it may seem ridiculous to make any big deal out of that little natural common sense phenomena - that when something is farther away it looks smaller. This simple idea is at the core of the concept of Proportion: that to make consistent measurements out there in the world, our measuring device must be consistent in size. Here's how this simple idea will work out in the world. There's a plane in the picture just below. It's huge! See how it dwarfs even the clouds it's passing behind? It's got to be at least a thousand feet long. Maybe two! Look at our drawing board there. 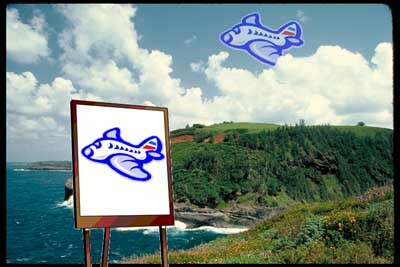 Let's pretend you've drawn the plane on the drawing board. Now tell me, which plane is bigger: the thousand foot long one that's behind the clouds in the sky, or the one that's on the 17" x 24" drawing pad on the drawing board? Is this starting to sound like one of those trick questions? Well it kind of is. But you tell me which is bigger first - as it rests right there on your screen. Then I'll tell you about the illusion at work in this picture. OK. Are you back? The one in the sky sure looks bigger, right? But did you use a ruler or your thumb to measure them? Instinctively you know the plane - if you were actually standing in that scene - would be hundreds even thousands of times bigger than the drawing. There's enough clues in the environment to tell you that (the hills, the clouds, etc.). In the above picture I've added our good old ruler. You can see they're the same size. ("Sighting" reminder: as you stood in this picture drawing the plane, you were holding your ruler with your outstretched arm so it was always the same distance from your eye :-). Learning to appreciate what the senses are quite accurately telling the brain, without allowing the brain to influence or distort that info is a big stumbling block to beginning artists. Again, if you were in this scene trying to draw the plane, you'd have to have a way of drawing it to scale (that is, proportionately) on your paper. And that's where sighting - the artist's "thumb thing", or using the ruler above - comes back in so handily. To maintain those proportions, sighting further allows you to make statements like "the tail of the plane is one fourth the length of the whole plane, and it's front wing is half as long as the entire plane when you measure it from fuselage to wing tip...", those kinds of things. 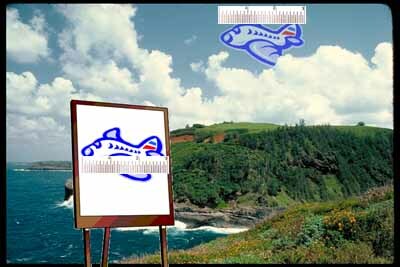 So whether the plane is in the sky or you're drawing it on three different sized papers, you can duplicate it accurately using those kinds of reckonings and proportions. Does this make sense? Your brain interprets the wheel as a circle even though the visual information coming through your eye says the wheels are turned and so now appear "oval". And like I said above, that's part of the glitch in drawing: drawing what you "know" to be true about something (the wheel being a circle), getting in the way of the sensory information coming in through, in this case, your eyes (the senses telling you a wheel viewed from any direction other than straight on will be oval). This distortion phenomenon is also known as "foreshortening". It's still under the general umbrella of 'proportion'. 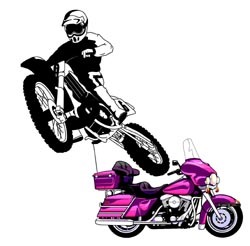 I'll illustrate: if you were looking at the same motocrosser above with his motorcycle in the same orientation as the big purple Harley-Davidson Electroglide behind it, it'd look longer than it does above. In the picture above, the whole airborne motorcycle is rotated and twisted in space, and so appears "foreshortened". One more example of foreshortening. Here's a 6 foot ladder. Does it look 6 feet long? Maybe so, but you're looking at it with one end right next to your eye and so it looks like it's narrowing at it's far end. The brain however adjusts for the change in perspective. Plus you know the 6 foot ladder is made of two parallel 6 foot rails connected by a bunch of rungs between the two rails. 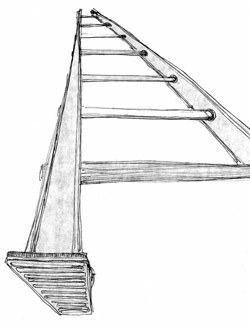 You don't have to say "hey that's a foreshortened ladder", the picture just makes sense to our brains. However, come time to draw it, you have to do your "sightings" and make measurements in order to draw it accurately - which again may cause a bit of a battle between your brain and what your senses are telling it. Why? Because your brain knows the two ends of the ladder are similar in width, but your senses are telling you that when viewed like they're viewed in the picture just above, one end is perceived as a whole lot wider. Make sense? Let's take formatting first. We already touched on it above. It's another trick you can use to increase the accuracy of your drawings and maintain proportion and perspective. Plus we can go through it pretty fast. What's a format? It's the frame or bounding border around a picture. Look around your house. All your paintings are framed, right? The frame's the format. Or your TV? It has the box built around the tube - that's a form of formatting also. That's all it is. It's a frame. Back to the chair example above. Remember I casually mentioned a camera's viewfinder above? When you look through a camera's viewfinder, you're looking through a rectangle of sorts. And the paper you draw your drawings on are rectangular in shape (for the most part), right? Those again are both instances of "formatting": They both put a frame around our subject. Now let's make a connection the two - between the drawing paper and the viewfinder. By "connection" I mean let's make the paper you draw on exactly proportionate to the rectangular shape of the viewfinder. So if your viewfinder gave you a view of 1 inch tall by 2 inches wide, then any paper, if it was proportionate to the viewfinder, could be 1 inch tall by 2 inches wide (not too practical for drawing), or five inches tall by ten inches wide, or one foot tall by two feet wide. Each size paper is proportionately the same as the viewfinder. Follow me so far? Seem artificial? Well here's the technique: you get to take control. Look at whatever you're drawing through a pre-cut viewfinder! Then just make sure your paper, the paper you're drawing on, is the exact same shape and proportion of the viewfinder you made. trace that same rectangular shape - which leaves you with, voila, a format drawn on your drawing paper of the exact same shape as you viewfinder. What's all this viewfinder business allow you to do? It allows you to duplicate exactly both the proportion, and the negative shapes around the chair (or whatever object it was you were drawing - remember "negative shapes from above? The shapes that literally "thin air" formed around and within the chair?). If you do your sightings with a ruler or your thumb and duplicate your findings right on your formatted paper, you're ten steps ahead of the competition in making a really believable drawing. One last detail about using viewfinders. If you're taking a picture with a camera and you move the camera while taking the picture, what do you get? You get a blurred picture. When drawing while using a viewfinder, it's really important to keep your head, the viewfinder, and the object all the same distances and in the same spots while you draw. Otherwise, the proportions change and the negative spaces around the object as you view it through the viewfinder will change and you won't be able to "sight" them accurately and consistently. Make sense? We're sighting the angle of the chair leg starting like this first: by lining up a pencil with the chair leg. After doing this, you ask "what angle does this form with either the horizontal or vertical border of the format?" After you answer that question, you can go and draw it on your formatted paper. Then you move the pencil down the part you're sighting to a point where it intersects a part of the format, in this case the horizontal border. Finishing our sighting - note the position of the pencil? Now, since both the angle the border of that arm makes with your viewfinder will be the same as the angle it forms with the vertical line of your formatted paper, you can accurately reproduce it. Pretty neat I would say :-). You learned about proportion and foreshortening, we touched on the trouble spot of drawing where the brain wants to impose itself over the senses. You learned about "sighting" as an antidote to the brain's distorting influences - as a way to use your senses to relating the overall relationships of different parts of the chair (or any subject). Then we expanded sighting to include measuring of angles, finding that all these parts formed angles with the format (and each other). Those are powerful new reckoning tools that can really help you make a leap in your drawing. Whew! Give yourself a hand for sticking through all of that :-). So here they are. Photographer Ansel Adams devised a great way to judge light and dark in a picture or photograph. Rather than trying to look at the whole world, and wasting all your time trying to figure out how the light and color in any given picture compares to the whole blazing spectrum, narrow it down. That is, only worry about what's in your picture. And what's "in your picture"? What's "in your picture" is whatever's within the frame (or "format"). It's what's ever bounded by edges, the boundaries you put on it: like what you see through your camera viewfinder, or out your window. It's a finite area. I know, that's still pretty vague. (See skills 1,2, and 3 above). 1) Can I say what's the brightest part of the picture? It's the part that's getting the the most direct light. In a photograph the brightest white is the pure white of the paper it's printed on - so it could be sun on the water, or snow, or a street light reflecting off chrome. In the picture above, the sphere, it's the the gap on the upper left part of the sphere, the gap on the actual circle that marks the border of the sphere, (you know, the circle part of it). That's called the "Highlight", or "Direct light". 3) What's in-between black and white? What are the "middle tones"? On the sphere above, see the little gray crescent inside the black crescent? That's reflected light. It's light that's bouncing off other things right by the sphere. (And thought you don't see the other objects, they're suggested by reflected light.) If our eyes were sensitive enough, we could see that even the "Dark Side of the Moon" contains some reflected light. (It's just that a crescent moon is so bright, it overwhelms the grays of the dark side.) You can further divide mid-tones up into shades of "reflected light" and shades of "blocked light". You use the exact same approach when dealing with color - but starting with judging blacks, grays and whites (known collectively as "grayscale"), will give you the foundation you need to make the move to color. 5) Putting it all Together. There's actually 2 things we're referring to here. You "put it all together" two different ways. First, you integrate skills, you combine skills like the way you did when you learned how to drive a car. You learned signaling, the meaning of road signs, how to judge stopping, merging, accelerating, driving in the snow, etc..
Then one day you realized you could do those things automatically, without even thinking about them. And second, you experience the "Eureka" effect first hand when you suddenly "get" something, when you grasp a concept, the way an insight rolls right through you when you have a sudden, full understanding, a "Gestalt". (The vase / face picture on the home page is just one example of this). The first "eureka", the "integrating skills" eureka, is largely a result of practice. You didn't come to earth knowing how to speak, read or write. Right? When you learned to write, you first learned how to hold a pencil. Then you learned the alphabet. You learned what each letter looked like: a curve here, a dot there, straight lines crisscrossing. You learned what the consonants and the vowels sounded like: the hard "K" of "Cat", the "fff" of fish, the long "O" of "charcoal". Then you learned how to write them, (actually draw them one letter at a time.) And you strung the letters together to form words, and you sounded them out by recalling the sound of the letters - until, little by little it all gelled in your brain: Voila! You discovered words, and then you recognized whole strings of letters as one word with a definite meaning and not a as grouping of letters. Then you progressed to reading. And writing. You grouped a whole string of lesser skills into one powerful, wonderful skill, a larger more encompassing skill whose sum is greater than it's parts. A skill that you probably take entirely for granted now. And that's exactly what will happen as you get practice, gain depth, and master the 5 skills of drawing. Point is this: you already make similar "shifts" all day long. You probably never thought of them as being anything special. When you master shifting from "left" to "right" brain skills consciously, that is, when you can make the shift at will, then you've taken a giant step in mastering the skills necessary to learn to draw. And now, seeing how simple (yet magical) it is, maybe you'll be willing to cut loose your desire to draw. Who knows, maybe you'll be cutting loose the next Picasso! Like these lessons so far? Here's an affordable, 1000+ page electronic book that covers all the basic's of drawing and how to draw faces and caricatures in much more depth - and with all sorts of exercises. You can find it at http://www.YouCanDraw.com.